Privacy and the country lifestyle await your family on this over half acre, fully renovated and highly customized home! 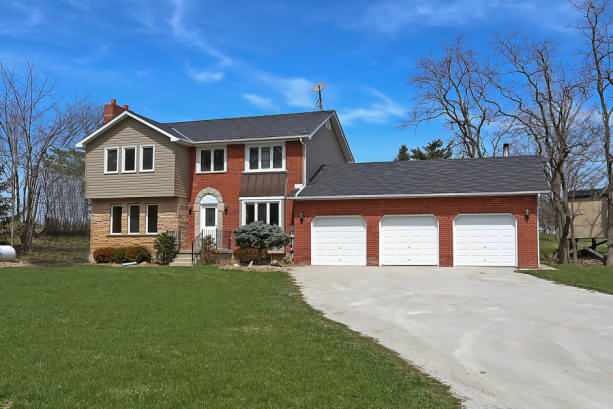 Combine the tranquil and peaceful rural setting with the convenience of being minutes away to shopping, major Highway 401, James Snow Parkway and transportation! Hike through nearby Rattlesnake Point or ski/swim at Kelso Lake, all within the Niagara Escarpment! 2,934 total square feet of luxury living space awaits! Make use of the main level den as a bedroom, with the convenience of the full 4 piece bath. Great floor plan allows for seamless transition throughout the main level living room and spacious dining room. Gleaming hardwood floors and wood burning fireplace add to the luxurious elements of the home. Generous kitchen with breakfast area transitions beautifully to the back deck and the great outdoors! The second level offers four bedrooms and two full bathrooms. The oversized master bedroom boasts a large walk-in closet with access to the private upper deck for morning coffee and staircase down to the backyard. The professionally finished lower level accommodate a large family with its sixth bedroom and large family room with cozy wood burning fireplace. Lots of room for storage too! An extra bonus awaits in the massive triple garage that accommodates three cars, a boat, or whatever vehicles you might have! It’s a fully insulated attached space with wood burning stove that could also act as a workshop for the hobbyist. This home makes a great investment with excellent current tenants willing to stay.